WINNERS ANNOUNCED: Retweet now and win ONE of three X3Max x3Jailbreak dongles! Winners will be contacted via Twitter for mailing address. We're back again with another contest for our loyal followers and readers. 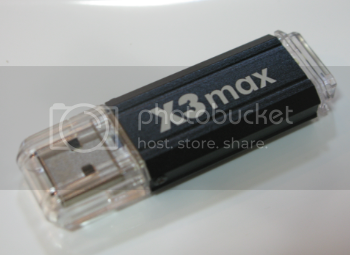 Having just posted our review of the X3Max x3Jailbreak USB microSD SDHC, why not have a contest!? If you own a PlayStation 3 and looking to play homebrew games and use homebrew applications, this is the jailbreak choice! Not only can you use an HEX file, but there is also a microSD(HC) slot. This DOES NOT work on PS3's with firmwares 3.42, 3.50 or above. If you have firmwares below 3.41, this will work. We would like to thank X3Max North America for sponsoring this giveaway and we highly recommend all of you to pick up your X3Max x3jailbreak from them. All you have to do is retweet the post about the giveaway (http://www.twitter.com/#!/dcemurevie...66524752826368), become a follower on Twitter and you will be automatically entered. If you already are a follower on Twitter, no worries! Just retweet about the giveaway. Only 1 entry per person. The contest ends December 1, 2010 and winners will be chosen randomly and first post will be updated with winners. Winners will be contacted through Twitter for mailing address. *DCEmu Reviews and DCEmu is not responsible for lost or damaged packages and/or electronic devices. All shipping of prizes are handled by X3Max.ca. Any concerns in regards to X3Max or shipping, please contact X3Max.ca.